The railway reached Tonbridge in 1842, with the arrival of the South Eastern Railway's (SER) main line from Redhill to Folkestone. A station was built on the site of the old Priory, on the opposite side of the road bridge from the present station. In 1845 a line to Tunbridge Wells (and Hastings) was opened by the SER. Because of the 1 in 47 gradient down which trains approached Tonbridge from the Ashford direction, the junction for Tunbridge Wells faced east, requiring all trains until 1857 to reverse direction. Competition with the London, Chatham and Dover Railway's (LCDR) route from Victoria to Dover led to the SER constructing a more direct route to London via Sevenoaks and Orpington; this opened in 1868. 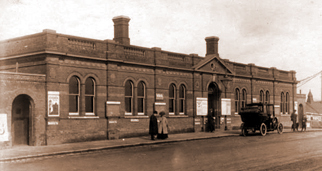 The station was moved to its present site at this time and the new building on the bridge is substantially that which exists today, after 'makeovers'. At rail level a significant rebuild of the facilities took place in 1934. The platforms were lengthened and the up side buildings were replaced so that the line to the bay platform could be extended through under the road bridge (now platform 1).The locomotive shed, located between the main line and the branch to Tunbridge Wells, was provided by the SER, probably from the opening of the line. An allocation of 64 locomotives in 1947 reflects Tonbridge's importance as a railway centre. It was closed followed the demise of steam in this area in 1965. Tonbridge has been the site of one particularly well-known accident. 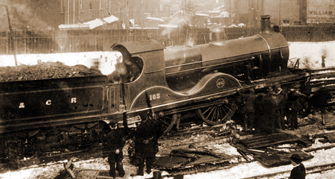 On 5th March 1909 a train from Redhill overran a signal and was hit by one coming from the Sevenoaks line. Two railwaymen on the first locomotive were killed. The Royal train, with King Edward VII en route to Biarritz, was delayed at Orpington and had to return to Chislehurst and take the former LCDR route to the channel. Despite Southern Railway plans for electrification of the Hastings line, by 1939 electric trains only reached Sevenoaks. Modernisation in the form of diesel-electric multiple units on the London to Hastings service came in 1957 and this line was electrified in 1986. The main line to Dover was electrified in 1961, leaving the original line from Redhill to be run by steam until January 1965; the whole future of this line remained in doubt, with diesel multiple units providing the service, until it was finally electrified in 1994. The railway changed Tonbridge in several ways. It altered the shape of the town, with extensive new development at the south end, drove the Medway Navigation Company out of business, and made possible the commuter life-style still shared by thousands of Tonbridgians. >More railway pictures on this website here. 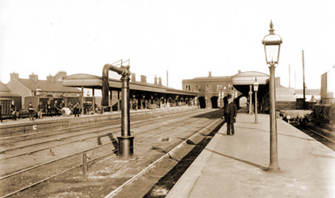 More information about Tonbridge railway station and west goods yard is on the very comprehensive Kent Rail website.